Here are the promised first pages of Puffin Post number 1 (in fact I don’t think it can really be said to have a number, but I have to call it something). It’s wonderful to read Kaye’s words in the light of the rebirth of the club. 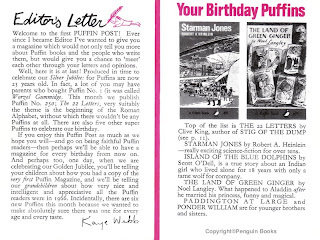 It’s very poignant considering the upcoming 70th anniversary of Puffin books. Wow – great to see my souvenirs getting a new lease of life thanks to your restoration! I think I must have found the magazine in a copy of the Land of Green Ginger when I was about 7 – probably in Heffer’s bookshop in Cambridge. Thank goodness I was able to persuade my mother to buy it for me! Thanks Ruth, It’s proving to be a real pleasure to bring your collection into circulation. I hope you still have the copy of ‘The Land of Green Ginger’, as the current editions have been abridged to ‘censor’ the less politically correct content. Old editions are selling for ridiculous amounts! Oh yes, but pretty well-worn by now!